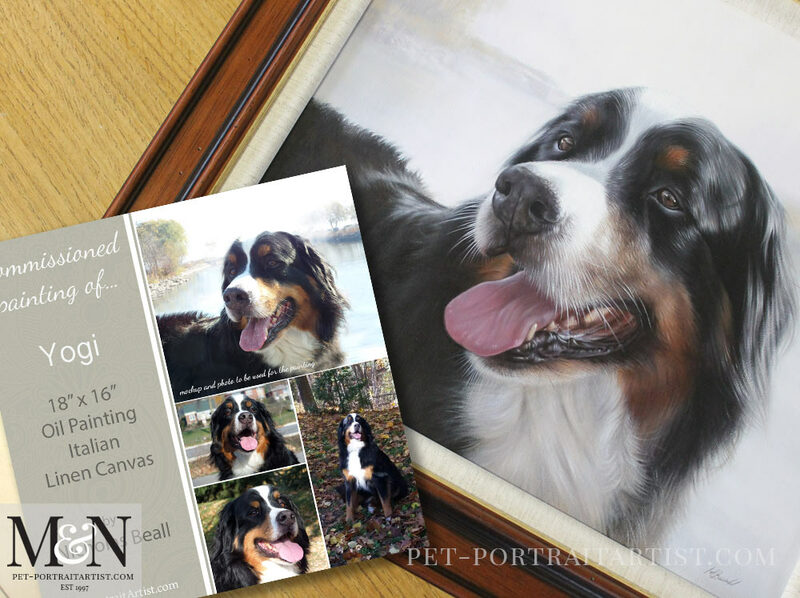 Introducing our ordering process for our pet portraits. 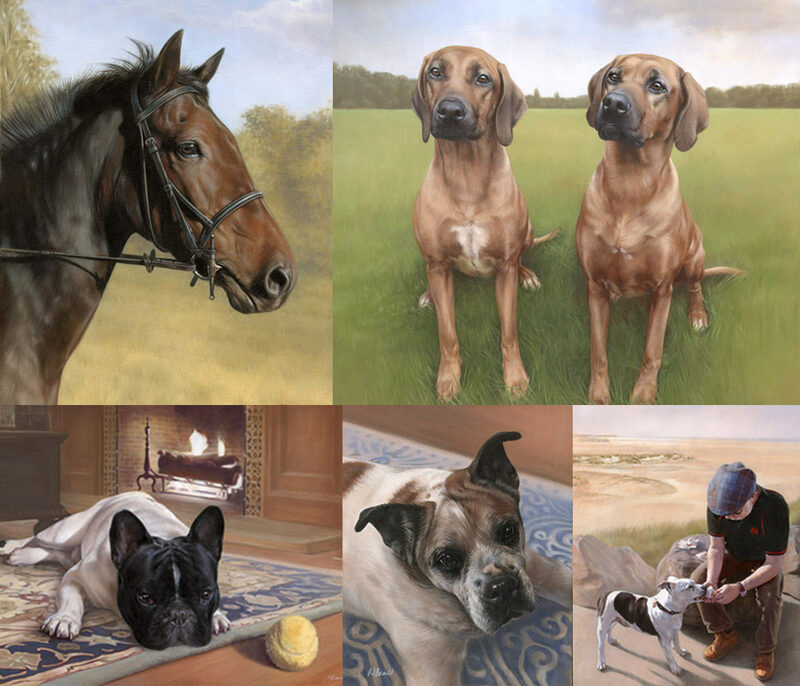 If you are looking to commission an oil painting or pencil drawing of your dog, cat or horse, our ordering process page might be perfect for you. The first step is to send us photos of your pet. Photos for a pet portrait is key. Ultimately, the better quality your photos, the better your portrait will be. We rely on your photos to give us everything we need to create a stunning portrait for you. The clearer your photo, the closer into the frame your pet is, the more information we can see, the more we can add into your portrait. We have lots of helpful tips about how to take photos of your pets on our website. If your pets have passed away it might also help you choose the best photos from your collection to send us. Visit our Pet Portraits Photography tips for a pet portrait for lots of help and guidance. Once you have chosen or taken your photos, you can email them to us. Send as many photos as you would like. Let us know your ideas for a pet portrait and we can create a mockup of how your portrait could look. We can amalgamate photos together and remove backgrounds so that you can see what the design of your portrait could be like. This is really helpful if you have more than one pet you would like in your portrait. Many clients ask us which is the best size to order for their pet portrait. It often depends on where you are thinking about displaying the portrait in your home. Perhaps you have a space over your fireplace. Or in a part of your home that your pet loved to sleep in the sunshine through the window. We are able to create our pet portraits to any size. Although we have set sizes on our prices page, we can cut our paper to any size. We have our canvases made bespoke. We have drawn portraits as small as 7 x 5 inches and painted portraits as large as 4′ x 5′. So we can paint and draw…large and small. If you would like to email us your photos and ideas for a pet portrait we can perhaps guide you as to which size might work well for you. Apart from our studio style backgrounds in oils, we can create full backgrounds in both our oil paintings and pencil drawings. The oil paintings are ultimately the best choice if you are looking for something really personal. You may have already seen the portrait Nicholas painted of three stunning Labradors in our clients garden. This allowed our clients to have a fully personal painting in full colour. For the pencil drawings, you can have a soft shaded background or a little more detail in vignette form. Have a look at the portrait of Stanley and Jarvis to give you an idea of how your portrait could look. It gives an outside feel without having too much detail to take away from the subjects. Both Nicholas and I have waiting lists for our portraits. Usually, we are working on average 3 to 5 months depending on the medium. If you are looking at having a portrait for a special date, please do let us know as soon as possible. Once we have arranged your portrait – ie we have your photos and designed your portrait, we can arrange the deposit. We ask for £200 for the pencil drawings and £500 for the oil paintings. I send a secure link via email for payment. Once we are ready to start your portrait we require the final balance. We then send final payment link in the same way as the deposit. The links are created for each client and they are sully secure. Our payment provider is Worldway and we accept all major Debit and credit cards including American Express. We work with a number of different framers here in the UK. Nicholas and myself have hand picked them over the years to work with us and our clients. Every frame we commission our framers to create is hand made bespoke for each client. Our frames are hand crafted and hand finished by experienced craftspeople with many years experience in their fields. We can provide our clients with many styles of frames from gold, silver, traditional plain woods, guided and even painted using farrow and ball paints to match your home decor. Our website houses two in-depth galleries for our clients to view some of the commissioned frames over the years. The oil painting framed gallery shows a lovely array of frames for the oil pet portraits. Similarly our Pencil Drawing Framed Gallery shows some beautiful frames commissioned by clients for their portraits too. 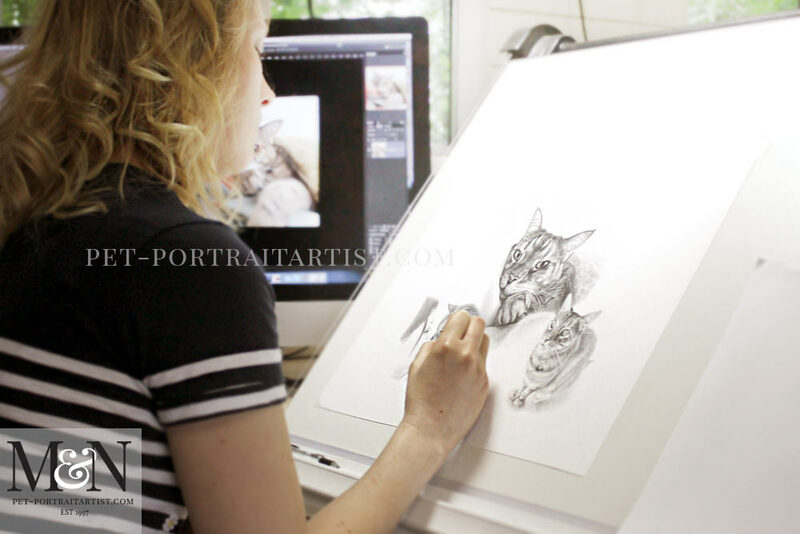 You can also see videos of the pet portraits framed in some of the gallery pages, with me chatting about them too. I have added one such video below..I hope you enjoy viewing it! If you are unable to find the ideal frame for you in our framing galleries, just let us know. We will help find a moulding that is perfect for you. Our framers have access to thousands of different mouldings. They can hand make and match frames you already have in your home if required. If time is running out for you to arrange a pet portrait as a surprise gift, our Gift a Portrait would be the perfect service for you. It is a fully personalised and bespoke online voucher style service. As you can see in the image below our client Shane ordered a Gift a Portrait voucher for his wife as a surprise on Christmas day. We created a bespoke voucher with Yogi’s photos and a mockup of how the pet portrait could look. These voucher images are bespoke to each client and they thoroughly enjoy receiving them. You can also see a photo below of the completed framed portrait, which Nicholas painted for Shane and his family. If you are interested in giving a portrait as a gift, just drop us a line and we can arrange this for you. We send our pet portraits via courier packaged very safely and securely. Having had over 20 years of experience with packing portraits, we have fine tuned our process. If you would like to see how we pack our paintings, pop over to our website and take a look at our ‘Follow a live Commission‘ page as it show photos step by step of our packing process. Our overseas portraits are sent via DHL on a fast tracked service. Our clients are notified by email at each stop which is a great comfort to know exactly where it is on its journey. We send all of our UK portraits Parcelforce 24 which are also tracked too. We take the utmost care sending our pet portraits to you. After all we have spent many, many hours on them so its our top priority to make sure they arrive safely home to you. If you would like to chat to us about a pet portrait in pencil or oils you are more than welcome to Email Us at any time. We would love to hear from you. If you have any questions, you can drop us a line, or perhaps take a look at our Pet Portraits Frequently Asked Questions page on our website. We hope you have found our Introducing our Ordering Process page helpful. Clients, prospective clients and readers of our blog can be contacted at any time via our website. Alternatively you can call us here on our art studio if you have any questions. We hope that you have enjoyed viewing our Art Studio Blog. Why not sign up to our Monthly newsletter accessible at the bottom of our website which comes out on the 1st of each month. Consequently this means, you can catch up on all of the portrait stories and news from our Art Studio! Please don’t forget to subscribe to our Youtube Channel too, share, like and follow our social media and you are more than welcome to comment below, we love hearing from our readers!